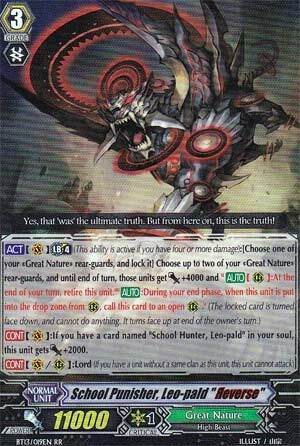 [CONT](VC):If you have a card named "School Hunter, Leo-pald" in your soul, this unit gets [Power]+2000. ...god that's a lot of text just for a cat...let's break it down. Leo Я has 11,000 Power, which is unique to Great Nature aside from its Break Ride, Chatnoir, and a very interesting Limit Break. At the cost of Locking a single unit, two of your rear-guards gain 4,000 Power, and at the End Phase, not only do they get destroyed, but they also get resurrected immediately afterwards, so overall, there's no harm done to your field in the end. Now, people might be asking what's the point of mentioning that they retire at the End Phase just to comeback 5 seconds later? Simple. Certain Great Nature cards activate when they are destroyed in the End Phase, like Hammsuke, Raccoon, Coiling Duckbill and Tick-Tock Flamingo, so it allows them to get their effects off before coming back ready and raring to continue the cycle of death-search-resurrection. Even Locking a single unit like this for a combined 8,000 power boost is pretty beneficiary as in the right hands, Leo Я is most certainly a threat when he arrives. Combined with Chatnoir and Duckbill, Leo Я is definitely a perfect choice for a solid balance of offense and defense for Great Nature. Next Time: Welp...time to be bias! Third in the week is School Punisher, Leo-pald "Reverse". Late Game you lock a rear-guard to give two units 4k, at the cost of retiring them during the End Phase. And then they instantly revive when retired? So what is this good for, exactly? It can't be for a field change up because not much would change in terms of optimal column forming. No, this card is supposed to be for recyclers such as the Hammsuke series, or the musical cards (Vocal Chicken, Recorder Dog and Pianika Cat) so that they can constantly spring their skills and increase your hand. Although keep in mind the music cards require taking up a Grade 3 slot, which is quite a lot to sacrifice for one gambit, so it's pretty restrictive. But the new Wash Up Raccoon that can recycle appropriate targets is a thing so there you go. And yes, I am fully aware of the combo that exists with this guy that people rave about (rest Tank Mouse to grant power, then lock Tank Mouse for more power) but to be honest I'm having to refer to MoFE once again in terms of having the same gambit. Leo-pald "Reverse" gets outpaced by him too by virtue of not needing specific units, being easier to set up and requiring less liberties. So honestly, recycling and increasing hand is pretty much the only viable way to use Leo-pald in my mind.